Daughter # 1 told me last night that Tita King is dead. I felt sad and told my daughter to find out where her body lies in state. We just have to be there. Tita King is Philippine's 1989 National Artist Awardee Lucresia Kasilag, dubbed First Lady of Philippine Music. She was my girls' mentor when my girls were with the Manila Children's Choir. She was a very patient and loving with the kids. I remember that she even personally taught daughter #1 to play the kumintang. It's a sad day for the Filipino Music community. You will be missed Tita King. 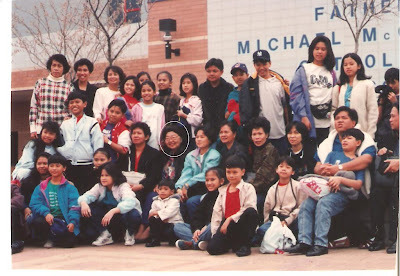 Tita King was almost always with the Manila Children's Choir's touring group. She was no prima donna and acted just like one of the "guys". This picture was taken in Missassagua, Toronto. That's Tita King sitting beside me.